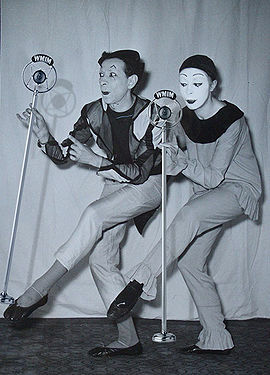 Mimes were a staple of radio in the 1920s. Silent radio was a broadcast medium popular prior to the introduction of talk radio. Silent radio operates in a range of below 20 decibels. The idea of combining wireless transmissions with live or recorded sound is nearly as old as the wireless itself, but because of the technical challenges involved, most radio was silent before the late 1920s. The first US silent radio licensee, KSHH in Pittsburgh, Pennsylvania, began broadcasting in August 1920. In December, sharp-eared radio enthusiasts first noticed the station's signal; by mid-1921, it became popular to build crystal radio tuners to hear the station's near-absence of static. Calvin Coolidge was among the earliest American political figures to grasp the potential of the new medium. As president, he earned the nickname "Silent Cal" through his series of "Fireside Shuts" that he used to express his support of activist government initiatives – specifically the lack thereof. Silent radio was a frequent venue for Hollywood stars, like Charlie Chaplin, who would frequently appear as his character of The Tramp. Universal Pictures heavily promoted the 1925 Lon Chaney feature, Phantom of the Opera, by airing key scenes on nationwide radio before the movie was released in theatres. Despite the popularity of silent radio, technicians continued to work on the problem of introducing sound to radio broadcasts. In 1927, jazz singer Al Jolson ushered in the dominance of music radio over silent radio. Commercial silent radio stations continued to operate until the mid-1950s, when John Cage began demanding royalty payments for his composition, 4'33" – driving most stations out of business. Increasingly desperate, on February 3, 1959, silent radio executives conspired to shoot down an airplane carrying Buddy Holly, Ritchie Valens, and J.P. "The Big Bopper" Richardson in a bid to restore their industry. However by 1965, the format had dwindled to the point that Simon and Garfunkel overdubbed their air guitar single, "The Sounds of Silence", with electric instruments for play on audible radio. During the late 1960's the remaining patent holders of the silent radio technology were approached by CIA operatives seeking to use the technology in their then-classified mind-control research program, MKULTRA. Pittsburgh native, Bob Lansberry, a radio enthusiast and successful business man was selected as an unwitting experimental subject in the study. He later devoted his life to increasing public awareness of this dark period in the history of silent radio. Silent radio remains popular among in specialized settings, such as public libraries, and among the hearing-impaired. Silent radio is still considered more lively than National Public Radio. This page was last edited on 19 December 2013, at 02:10.